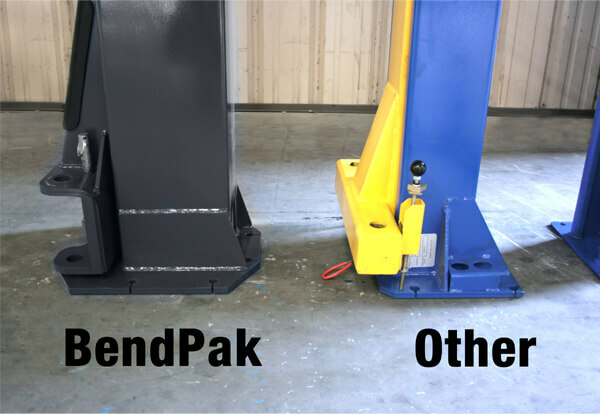 After exhaustively reviewing the merits of both BendPak® and a typical non-certified bargain asymmetric two-post hoists, the BendPak® team released the following report. In it, critical design features are compared, evaluated and illustrated in broad detail. Established hoist manufacturing companies will proudly place their brand name on their product. Unfortunately, many hoist “brands” are just labels fabricated by dealers supplying these products as their own. 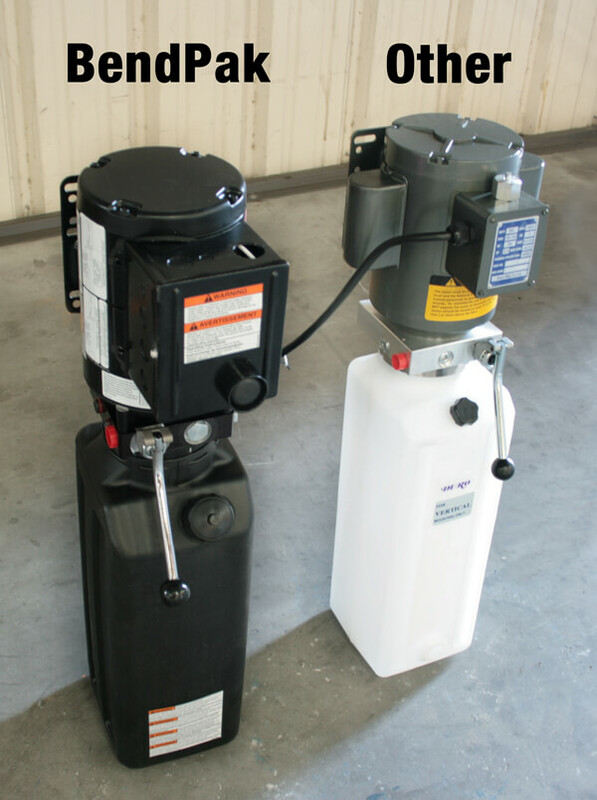 If you find an auto hoist that interests you, be sure to search for an informative and detailed manufacturing company website, or at least a brochure. Also check to see if there are multiple dealers offering the same brand for sale. Some dealers may bill themselves as exclusive suppliers, but only for a brand that they created. If you can’t find solid, verifiable information relating to the actual manufacturer of any given automotive hoist , or if only a very limited number of dealers even sell the hoist, you are probably best off searching for alternative options. Value is a word that gets thrown around a lot these days. Everyone is looking for the best value whenever they purchase something. Equipment retailers have latched on to this idea; they try to position themselves as “value leaders” by offering cheap products at low prices. But when you think about the true meaning of value, two primary things should be considered. (1) How much you’re paying and (2) what you’re getting for that amount. Discount hoist retailers want you to forget about the second part of the equation. They claim to provide the best value, but they are only providing you the best price. 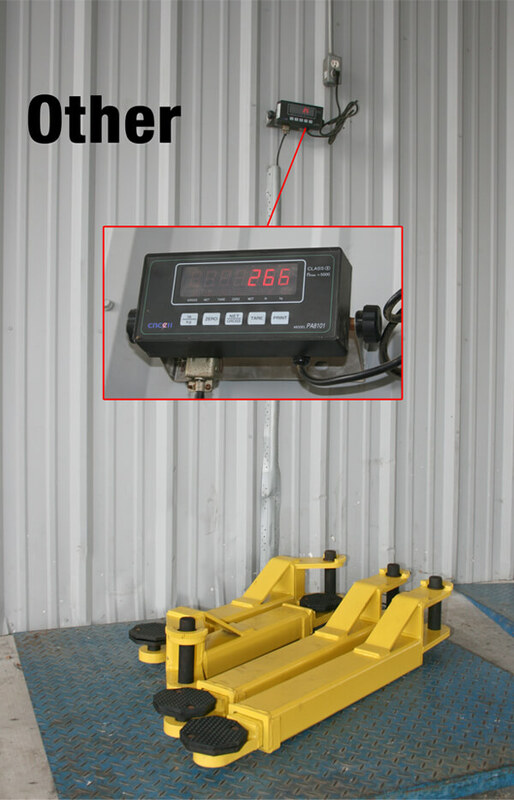 Business owners know that they need to consider the overall cost of the automotive hoist throughout its entire life of service. The checklist is slightly different for home users who don’t plan on earning revenue off of the purchase. For them, saving a couple hundred bucks can still mean the difference between enjoying time in the garage and having a total service nightmare. 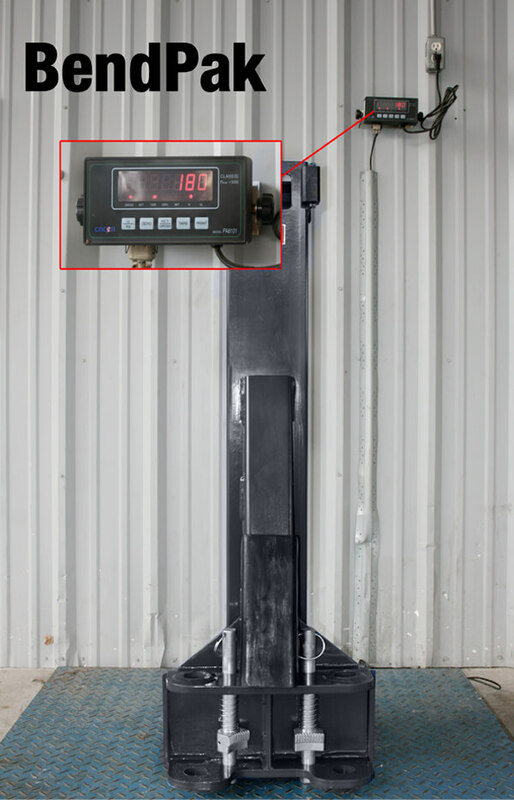 While an expensive car ​hoist will not always mean high-quality materials, an exceptionally low-priced automotive hoist will almost certainly be cheaply made. That means no engineering to speak of, compromised safety systems and thinner steel. These are the kinds of things that can cost a business owner untold thousands of dollars in damage or downtime. Car enthusiasts are willing to spend thousands of dollars on their beautiful automobiles, but they senselessly cut corners on the very thing that holds the cars up. There’s nothing wrong with shopping around for a good price, but make sure you are willing to at least pay for the value you hope to get out of your new car hoist. 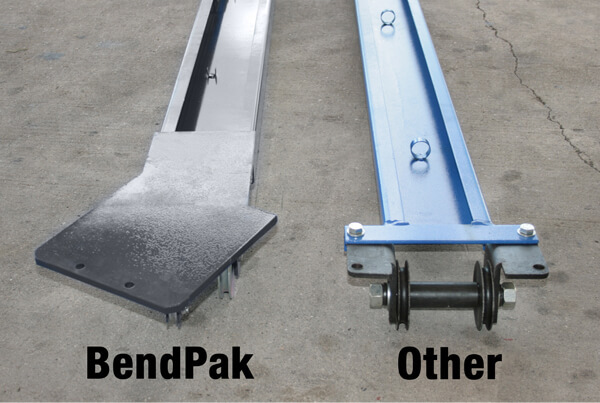 At BendPak, we believe the customer should always get what he or she wants. The best way to do that is for the customer to have all the information available. 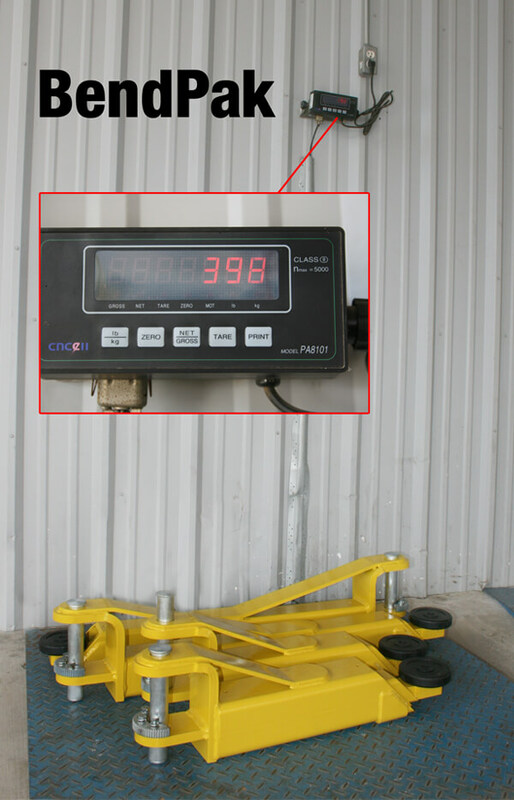 However, it’s difficult for the average consumer to do their own ​hoist comparison, particularly when the true manufacturer of many hoists is kept secret by the reseller. We purchased one of the more popular no-name hoists on the market that are sold on many websites under a variety brand names. 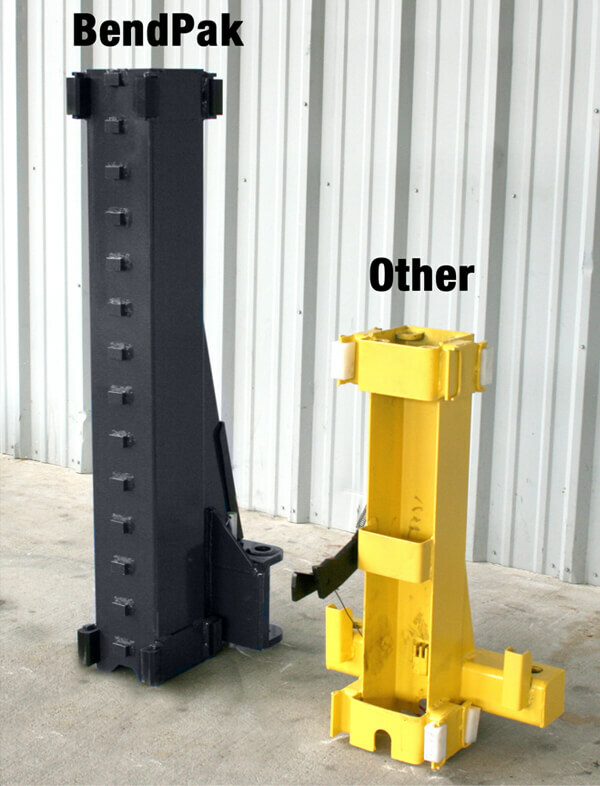 There is a very good reason why these hoists are sold for hundreds of dollars less than a BendPak. Check out this side-by-side comparison and determine for yourself which hoist is safer and which is really the better value. 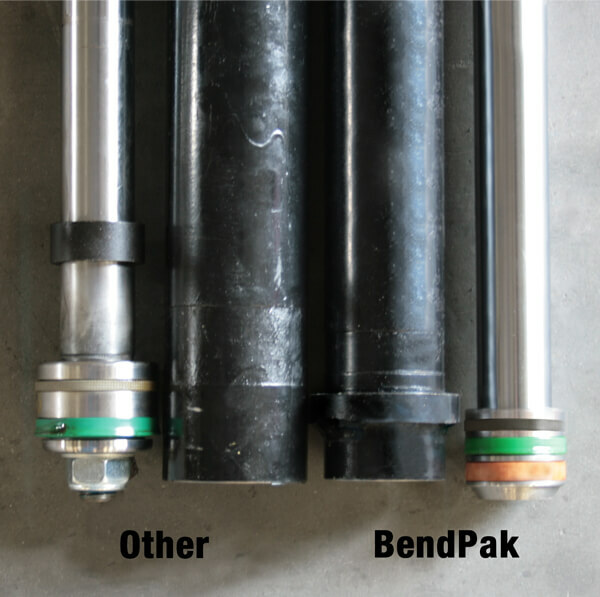 BendPak single-piece columns are stronger, safer. 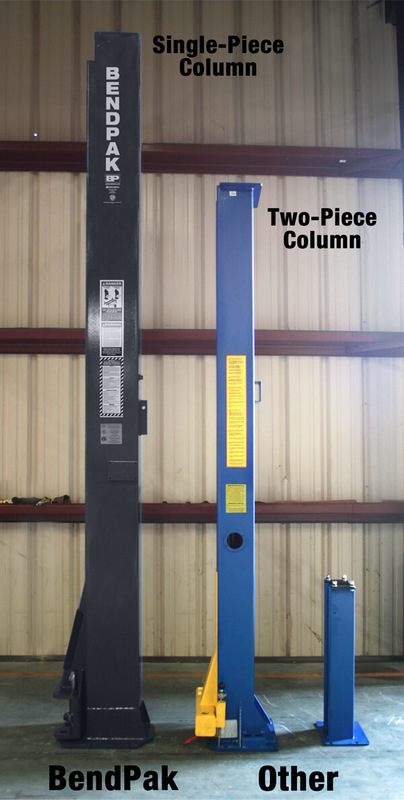 Side view of column comparison. 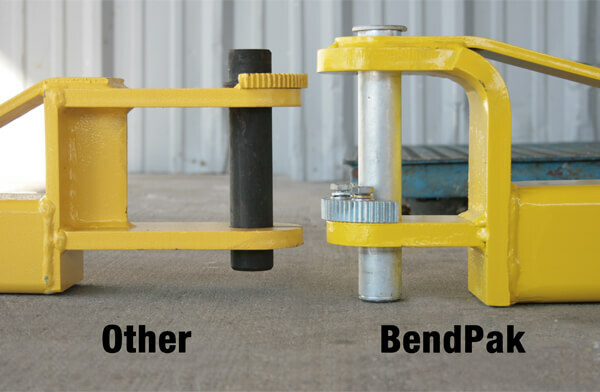 Wider, sturdier baseplates from BendPak. 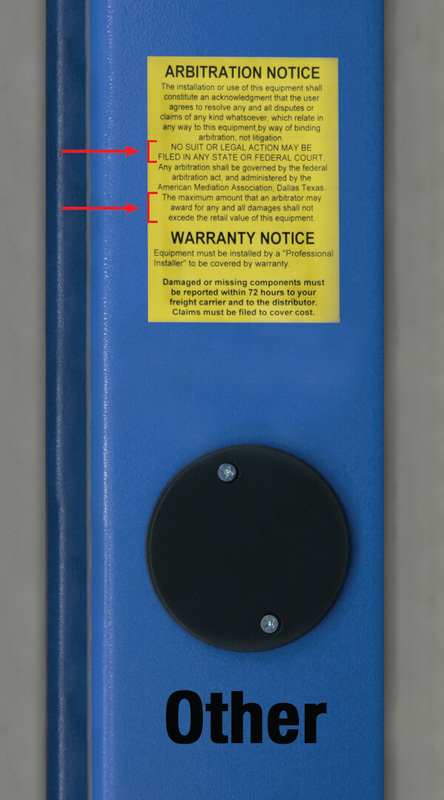 Warning label on a cheap, uncertified hoist. 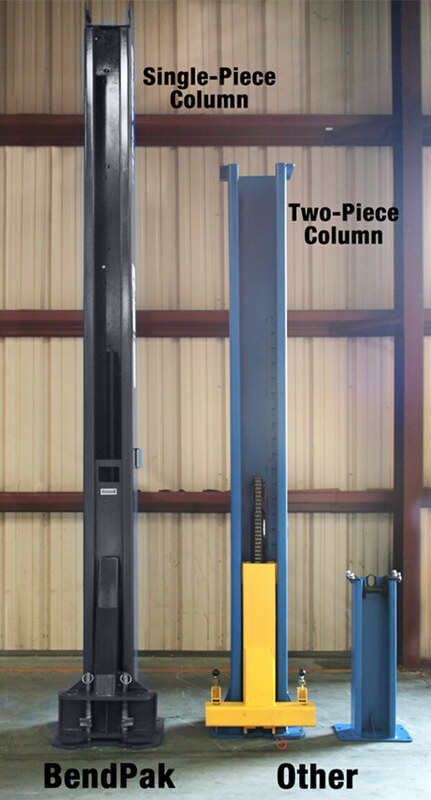 BendPak column weighs in at 246 kg. 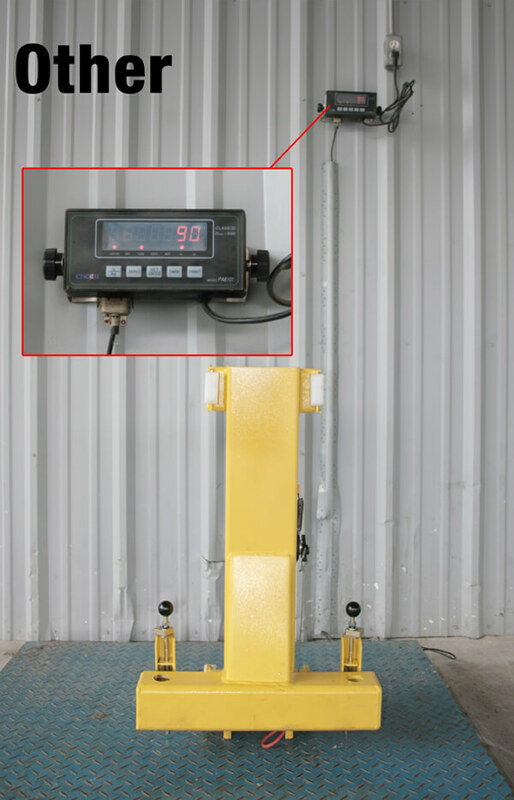 Uncertified hoist column weighs in at ​207 kg. Where's all the engineering gone? 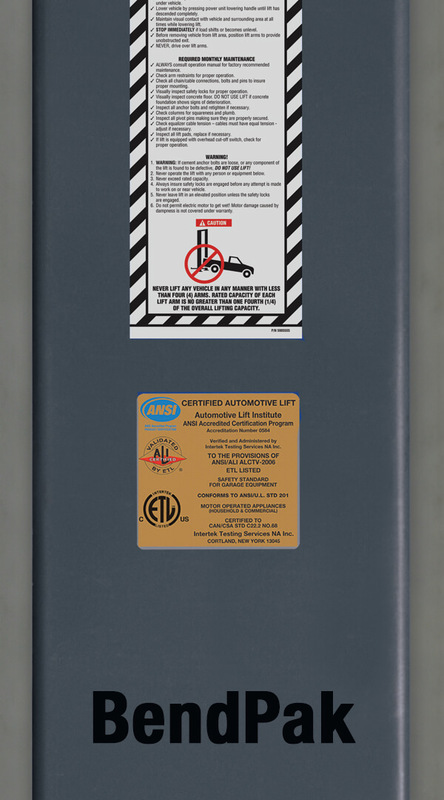 The taller lift carriage is critical for user safety and hoist preservation. 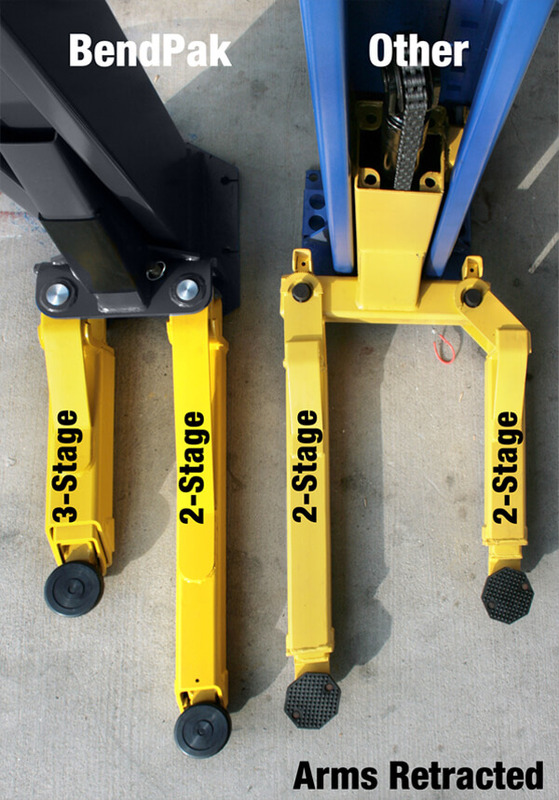 More locking positions on a taller, single-piece carriage. Lock nubs are welded for permanent hold and true peace-of-mind. Top view of taller carriage. 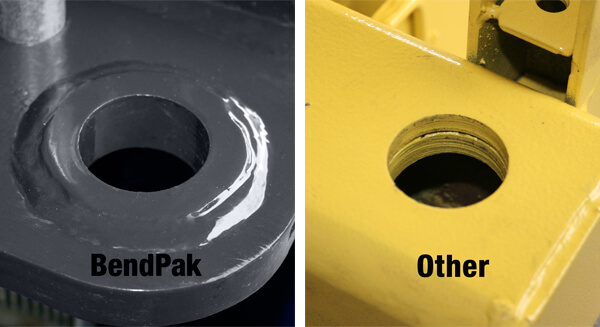 Beefier slide blocks are zero-maintenance for lifespan of hoist. 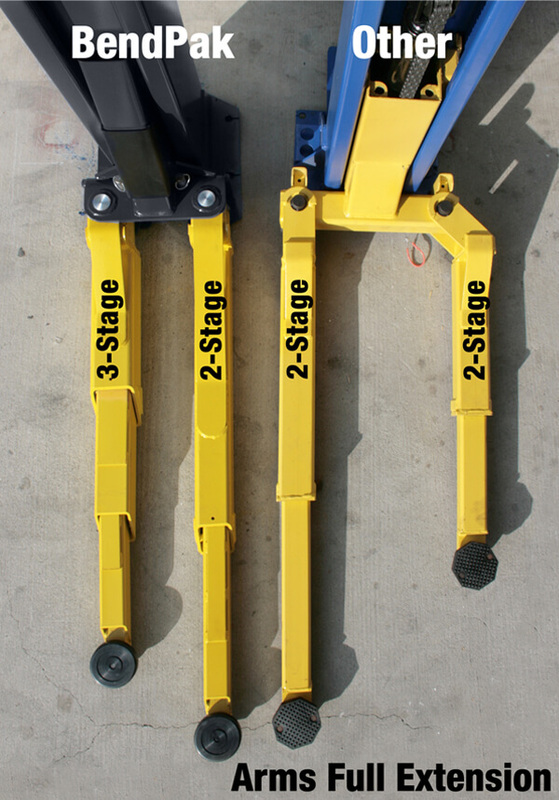 Raised arm attachment location and a better-engineered product. 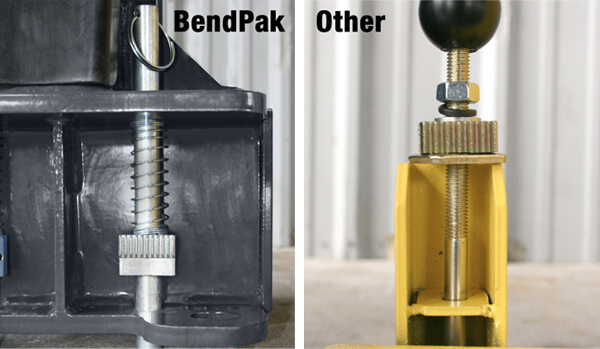 BendPak's robust arm restraint leaves no room for doubt which is the superior design. 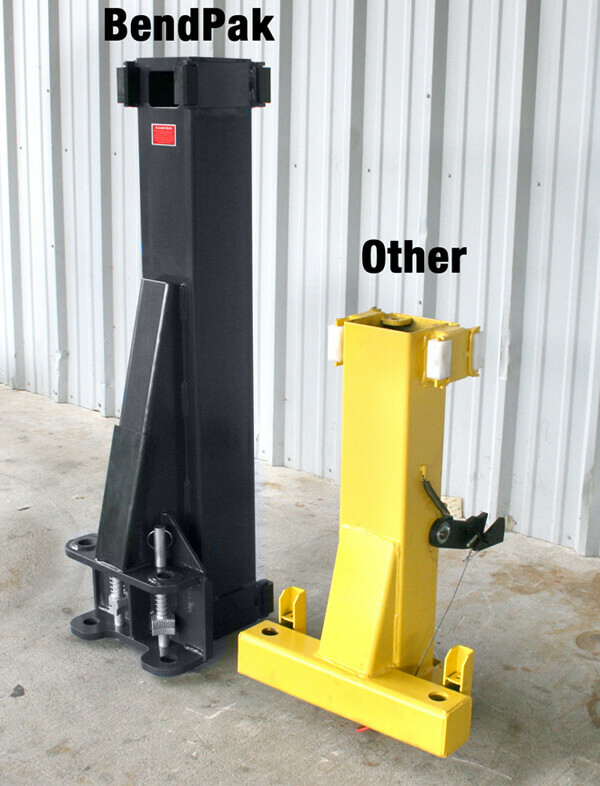 Lift carriage is twice as heavy as uncertified hoist. Revealed to be much lighter-duty when put on the scale and compared to BendPak. Side view of arm restraints shows BendPak's superiority. With lifting arms retracted, hoists look similar. With arms extended, BendPak is the clear winner. BendPak arms weigh in at 181 kg. Light-duty, uncertified arms weight only 161 kg. 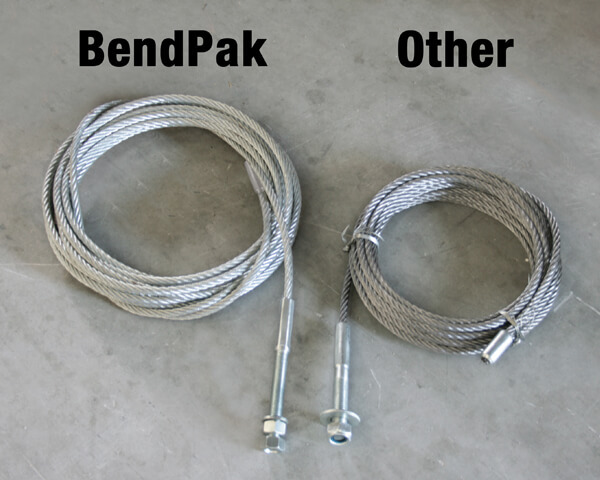 Massive ​127 mm BendPak wire rope sheaves vs. smaller 76 mm competitor sheaves. Top beam offers more security, superior welds and betters overall construction. 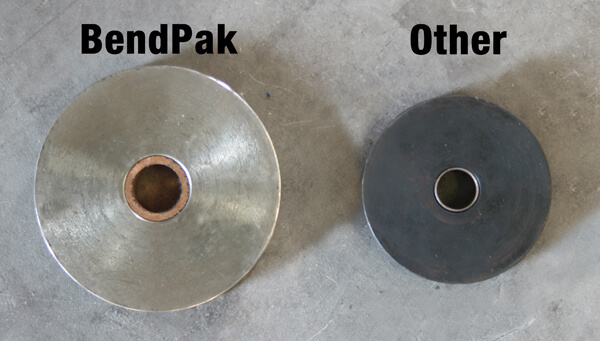 Far more seals on the BendPak cylinder rod end. *Throttle valve opens to 100% max pump flow during rise, then closes and reduces flow during descent. 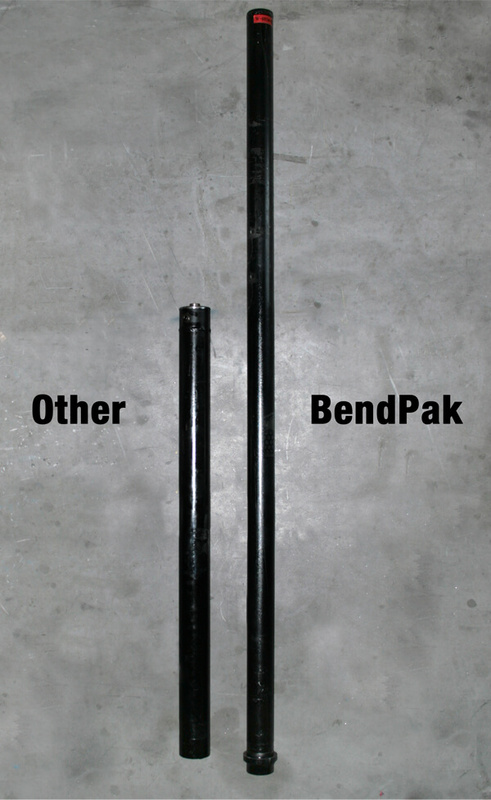 BendPak full cylinder is significantly longer than the competition. 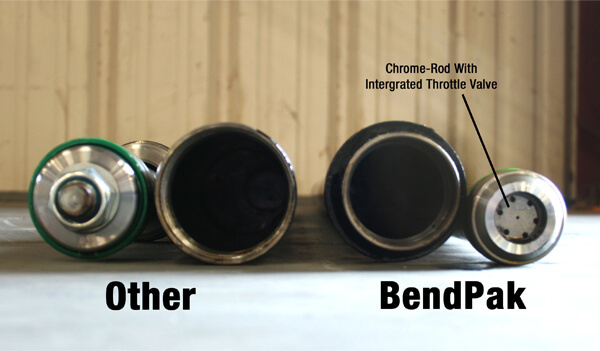 Larger, stronger aircraft-quality cables come from BendPak. 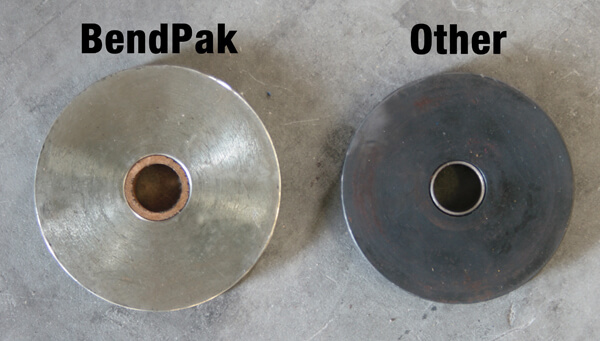 Massive column sheaves from BendPak will drastically increase the lifecycle of your hoist. 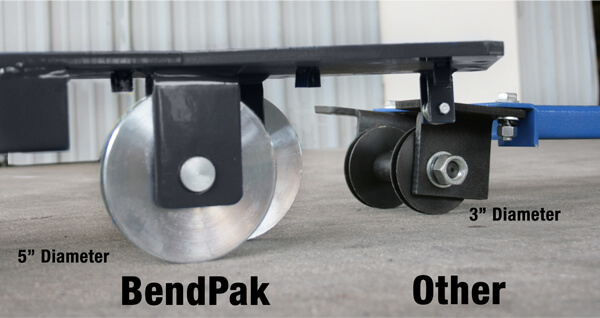 Upper sheaves are equally sized the BendPak hoist, but much smaller on the competitor's ​hoist. 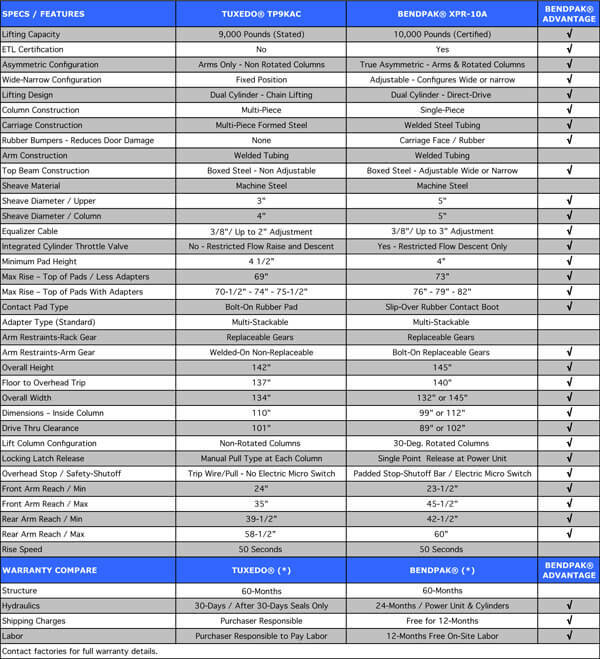 Power unit size and quality comparison. 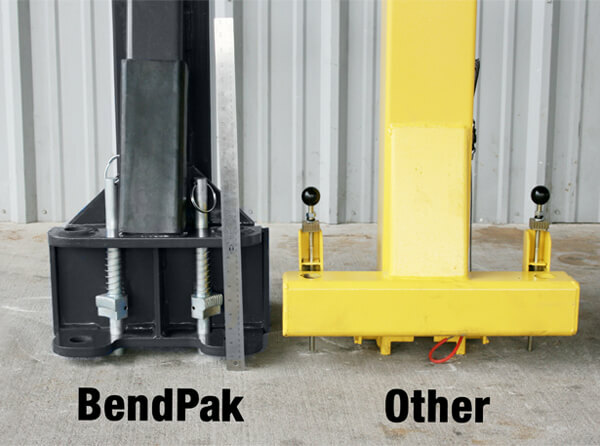 See an overview of our BendPak vs. Tuxedo two-post hoist comparison.